When was the last time your prayers for all people included oppressive leaders, child molesters, or terrorists? My church’s worship service includes a time called Prayers of the People when attendees share joys and concerns with the congregation. People give thanks for birthdays, improved health, and new jobs. They ask for healing from cancer, help for the homeless, and comfort for grieving hearts. Paul’s advice in his letter to Timothy is meant precisely for this type of public prayer during worship. In the original Greek, ‘first of all’ means to prioritize, and ‘all people’ means every human existence. Paul emphasizes the necessity of prayer for friends and enemies, believers and non-believers, and those with whom we agree and disagree. 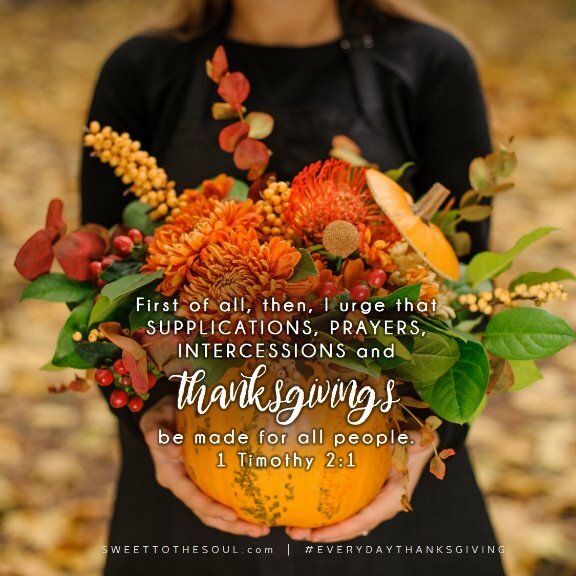 Paul enumerates every kind of prayer, so we must include their needs and, harder still, give God thanks for them. My church often prays for solutions to societal problems, victims, and peace, but I’ve never heard public prayer for the ‘bad guys’ like human traffickers and murderers. While I can imagine us praying that they find Christ and give their lives to Him, it’s somehow unfathomable to thank God for them. Yet Paul teaches us to give thanks for every human being. It’s hard stuff. As image bearers of God, every person has the potential to be good and loving. We may need to dig deep for thanksgiving, but just like us, they too are children of God. Paul specifically mentions leaders at every level, from our President, Congress and Supreme Court Justices to our state/local officials and policemen. We must pray on their behalf and thank God for them despite our differences. His instruction even includes world leaders whose goal is to destroy the West and all of Christianity. Yes, even the terrorists. Paul doesn’t give these instructions lightly. His world resembled our own. Rome persecuted and martyred Christians. The emperor Nero used Christians as human torches, burning them alive for entertainment. Paul knew how unimaginable it was to thank God for these leaders. Paul had a unique perspective and knew our inability to foresee God’s plans. Before his conversion, Paul’s name was Saul, the leading persecutor of believers. A well educated, prominent Pharisee, motivational leader, and gifted speaker, Saul was passionately determined to eliminate Christianity. Yet God converted Saul the persecutor into Paul the Apostle, our most renowned missionary who spread the gospel across the ancient world and wrote much of the New Testament. God is sovereign. Nothing is impossible as He controls history and orchestrates events for His own purposes. Sometimes He lets people and nations go far astray before acting, but He is always able to use a person or situation for the Kingdom. God used the pagan King Nebuchadnezzar of Babylon to send the Jews into exile (Daniel 1:2). Later God moved the heart of the Cyrus King of Persia (Ezra 1:1, NIV), the Lord’s anointed (Isaiah 45:1), to allow their return to Jerusalem and to help them rebuild the temple. 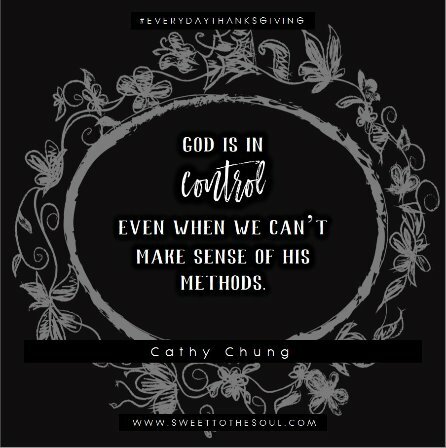 God is in control even when we can’t make sense of His methods. Fortunately we have the distinct advantage of knowing how the story ends. God wins. Over all worldly leaders, Jesus is King. So let’s pray for all people. Let’s thank God for their talents and pray that He would use them for Kingdom purposes. Let’s intercede on their behalf asking God to soften their hearts to the truth of Jesus, for this is good and pleasing in His sight. Let’s ask for peace and freedom to live as Christians. Loving and Sovereign God, we pray for every person you have knit together and known from before birth. Help us see them as your precious children, especially those we call ‘bad’. We give thanks that you are in control and trust your perfect plan.